Piezoelectricity is the ability of some materials (notably crystals and certain ceramics) to generate an electric potential in response to applied mechanical stress. This may take the form of a separation of electric charge across the crystal lattice. If the material is not short-circuited, the applied charge induces a voltage across the material. The word is derived from the Greek piezein, which means to squeeze or press. The piezoelectric effect is reversible in that materials exhibiting the direct piezoelectric effect (the production of electricity when stress is applied) also exhibit the converse piezoelectric effect (the production of stress and/or strain when an electric field is applied). For example, lead zirconate titanate crystals will exhibit a maximum shape change of about 0.1 percent of the original dimension. The effect finds useful applications, such as the production and detection of sound, generation of high voltages, electronic frequency generation, microbalances, and ultra fine focusing of optical assemblies. The pyroelectric effect, where a material generates an electric potential in response to a temperature change, was studied by Carolus Linnaeus and Franz Aepinus in the mid-eighteenth century. Drawing on this knowledge, both René Just Haüy and Antoine César Becquerel posited a relationship between mechanical stress and electric charge; however, experiments by both proved inconclusive. The first demonstration of the direct piezoelectric effect was in 1880, by the brothers Pierre Curie and Jacques Curie. They combined their knowledge of pyroelectricity with their understanding of the underlying crystal structures that gave rise to pyroelectricity to predict crystal behavior, and demonstrated the effect using crystals of tourmaline, quartz, topaz, cane sugar, and Rochelle salt (sodium potassium tartrate tetrahydrate). Quartz and Rochelle salt exhibited the most piezoelectricity. The Curies, however, did not predict the converse piezoelectric effect. The converse effect was mathematically deduced from fundamental thermodynamic principles by Gabriel Lippmann in 1881. The Curies immediately confirmed the existence of the converse effect, and went on to obtain quantitative proof of the complete reversibility of electro-elasto-mechanical deformations in piezoelectric crystals. For the next few decades, piezoelectricity remained something of a laboratory curiosity. More work was done to explore and define the crystal structures that exhibited piezoelectricity. This culminated in 1910, with the publication of Woldemar Voigt's Lehrbuch der Kristallphysik (textbook on crystal physics), which described the 20 natural crystal classes capable of piezoelectricity, and rigorously defined the piezoelectric constants using tensor analysis. The first practical application for piezoelectric devices was sonar, first developed during World War I. In France in 1917, Paul Langevin and his coworkers developed an ultrasonic submarine detector. The detector consisted of a transducer, made of thin quartz crystals carefully glued between two steel plates, and a hydrophone to detect the returned echo. By emitting a high-frequency chirp from the transducer, and measuring the amount of time it takes to hear an echo from the sound waves bouncing off an object, one can calculate the distance to that object. The use of piezoelectricity in sonar, and the success of that project, created intense development interest in piezoelectric devices. Over the next few decades, new piezoelectric materials and new applications for those materials were explored and developed. Piezoelectric devices found homes in many fields. Ceramic phonograph cartridges simplified player design, were cheap and accurate, and made record players cheaper to maintain and easier to build. The development of the ultrasonic transducer allowed for easy measurement of viscosity and elasticity in fluids and solids, resulting in huge advances in materials research. Ultrasonic time-domain reflectometers (which send an ultrasonic pulse through a material and measure reflections from discontinuities) could find flaws inside cast metal and stone objects, improving structural safety. During World War II, independent research groups in the United States, Russia, and Japan discovered a new class of human-made materials, called ferroelectrics, which exhibited piezoelectric constants many times higher than natural materials. This led to intense research to develop barium titanate and later lead zirconate titanate materials with specific properties for particular applications. Development of piezoelectric devices and materials in the United States was kept within the companies doing the development, mostly due to the wartime beginnings of the field, and in the interests of securing profitable patents. New materials were the first to be developed—quartz crystals were the first commercially exploited piezoelectric material, but scientists searched for higher-performance materials. Despite the advances in materials and the maturation of manufacturing processes, the United States market had not grown as quickly. Without many new applications, the growth of the United States' piezoelectric industry suffered. In contrast, Japanese manufacturers shared their information, quickly overcoming technical and manufacturing challenges and creating new markets. Japanese efforts in materials research created piezoceramic materials competitive to the U.S. materials, but free of expensive patent restrictions. Major Japanese piezoelectric developments include new designs of piezoceramic filters, used in radios and televisions, piezo buzzers and audio transducers that could be connected directly into electronic circuits, and the piezoelectric igniter which generates sparks for small engine ignition systems (and gas-grill lighters) by compressing a ceramic disc. Ultrasonic transducers that could transmit sound waves through air had existed for quite some time, but first saw major commercial use in early television remote controls. These transducers now are mounted on several car models as an echolocation device, helping the driver determine the distance from the rear of the car to any objects that may be in its path. Bone—Bone exhibits some piezoelectric properties due to the apatite crystals, and it is hypothesized that as a means of regulating bone formation the electromagnetic waves stimulate bone growth. Lead zirconate titanate (Pb(ZrTi)O3)—More commonly known as PZT, lead zirconate titanate is the most common piezoelectric ceramic in use today. Polyvinylidene fluoride (PVDF)—PVDF exhibits piezoelectricity several times larger than quartz. Unlike ceramics, where the crystal structure of the material creates the piezoelectric effect, in polymers the intertwined long-chain molecules attract each and repel other when an electric field is applied. Direct piezoelectricity of some substances like quartz, as mentioned above, can generate potential differences of thousands of volts. Probably the best-known application is the electric cigarette lighter: Pressing the button causes a spring-loaded hammer to hit a piezoelectric crystal, and the high voltage produced ignites the gas as the current jumps over a small spark gap. The portable sparkers used to light gas grills or stoves work the same way, and many types of gas burners now have built-in piezo-based ignition systems. A similar idea is being researched by DARPA in the United States in a project called Energy Harvesting, which includes an attempt to power battlefield equipment by piezoelectric generators embedded in soldiers' boots. However,these energy harvesting sources by association have an impact on the body. DARPA's effort to harness 1-2 Watts from continuous shoe impact while walking were abandoned due to the impracticality and the discomfort from the additional energy expended by a person wearing the shoes. A piezoelectric transformer is a type of AC voltage multiplier. Unlike a conventional transformer, which uses magnetic coupling between input and output, the piezoelectric transformer uses acoustic coupling. An input voltage is applied across a short length of a bar of piezoceramic material such as PZT, creating an alternating stress in the bar by the inverse piezoelectric effect and causing the whole bar to vibrate. The vibration frequency is chosen to be the resonant frequency of the block, typically in the 100 kilohertz to 1 megahertz range. A higher output voltage is then generated across another section of the bar by the piezoelectric effect. Step-up ratios of more than 1000:1 have been demonstrated. An extra feature of this transformer is that, by operating it above its resonant frequency, it can be made to appear as an inductive load, which is useful in circuits that require a controlled soft start. These devices can be used in DC-AC inverters to drive CCFLs. Piezo transformers are some of the most compact high voltage sources available. The principle of operation of a piezoelectric sensor is that a physical dimension, transformed into a force, acts on two opposing faces of the sensing element. Depending on the design of a sensor, different "modes" to load the piezoelectric element can be used: Longitudinal, transversal and shear. Detection of pressure variations in the form of sound is the most common sensor application, for example, piezoelectric microphones (sound waves bend the piezoelectric material, creating a changing voltage) and piezoelectric pickups for electrically amplified guitars. A piezo sensor attached to the body of an instrument is known as a contact microphone. For many sensing techniques, the sensor can act as both a sensor and an actuator—often the term transducer is preferred when the device acts in this dual capacity, but most piezo devices have this property of reversibility whether it is used or not. Ultrasonic transducers, for example, can inject ultrasound waves into the body, receive the returned wave, and convert it to an electrical signal (a voltage). Most medical ultrasound transducers are piezoelectric. Piezoelectric elements are also used in the detection and generation of sonar waves. Power monitoring in high power applications (e.g. medical treatment, sonochemistry and industrial processing). Piezoelectric microbalances are used as very sensitive chemical and biological sensors. Piezos are sometimes used in strain gauges. Piezoelectric transducers are used in electronic drum pads to detect the impact of the drummer's sticks. Automotive engine management systems use a piezoelectric transducer to detect detonation, by sampling the vibrations of the engine block. Ultrasonic piezo sensors are used in the detection of acoustic emissions in acoustic emission testing. As very high voltages correspond to only tiny changes in the width of the crystal, this width can be changed with better-than-micrometer precision, making piezo crystals the most important tool for positioning objects with extreme accuracy—thus their use in actuators. Loudspeakers: Voltages are converted to mechanical movement of a piezoelectric polymer film. Piezoelectric elements can be used in laser mirror alignment, where their ability to move a large mass (the mirror mount) over microscopic distances is exploited to electronically align some laser mirrors. By precisely controlling the distance between mirrors, the laser electronics can accurately maintain optical conditions inside the laser cavity to optimize the beam output. A related application is the acousto-optic modulator, a device that vibrates a mirror to give the light reflected off it a Doppler shift. This is useful for fine-tuning a laser's frequency. Atomic force microscopes and scanning tunneling microscopes employ converse piezoelectricity to keep the sensing needle close to the probe. Inkjet printers: On many inkjet printers, piezoelectric crystals are used to control the flow of ink from the cartridge to the paper. Diesel engines: High-performance common rail diesel engines use piezoelectric fuel injectors, first developed by Siemens AG, instead of the more common solenoid valve devices. The piezoelectrical properties of quartz are useful as standard of frequency. Quartz clocks employ a tuning fork made from quartz that uses a combination of both direct and converse piezoelectricity to generate a regularly timed series of electrical pulses that is used to mark time. The quartz crystal (like any elastic material) has a precisely defined natural frequency (caused by its shape and size) at which it prefers to oscillate, and this is used to stabilize the frequency of a periodic voltage applied to the crystal. The same principle is critical in all radio transmitters and receivers, and in computers where it creates a clock pulse. Both of these usually use a frequency multiplier to reach the megahertz and gigahertz ranges. Types of piezoelectric motor include the well-known traveling-wave motor used for auto-focus in reflex cameras, inchworm motors for linear motion, and rectangular four-quadrant motors with high power density (2.5 watt/cm³) and speed ranging from 10 nm/s to 800 mm/s. All these motors work on the same principle. Driven by dual orthogonal vibration modes with a phase shift of 90°, the contact point between two surfaces vibrates in an elliptical path, producing a frictional force between the surfaces. Usually, one surface is fixed causing the other to move. In most piezoelectric motors the piezoelectric crystal is excited by a sine wave signal at the resonant frequency of the motor. Using the resonance effect, a much lower voltage can be used to produce a high vibration amplitude. The TU Darmstadt in Germany researches ways to reduce and stop vibrations by attaching piezo elements. When the material is bent by a vibration in one direction, the system observes the bend and sends electric power to the piezo element to bend in the other direction. Such an experiment was shown at the Material Vision Fair in Frankfurt in November 2005. Several panels were hit with a rubber mallet, and the panel with the piezo element immediately stopped swinging. The research team sees future applications in cars and houses to reduce noise. 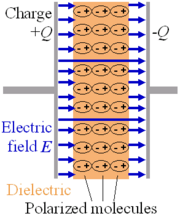 Any spatially separated charge will result in an electric field, and therefore an electric potential. Shown here is a standard dielectric in a capacitor. In a piezoelectric device, mechanical stress is the cause for the charge separation in the individual atoms of the material, rather than an externally applied voltage. Of the thirty-two crystal classes, twenty-one are non-centrosymmetric (not having a centre of symmetry), and of these, twenty exhibit direct piezoelectricity (the 21st is the cubic class 432). Ten of these are polar (such as spontaneously polarize), having a dipole in their unit cell, and exhibit pyroelectricity. If this dipole can be reversed by the application of an electric field, the material is said to be ferroelectric. In a piezoelectric crystal, the positive and negative electrical charges are separated, but symmetrically distributed, so that the crystal overall is electrically neutral. Each of these sites forms an electric dipole and dipoles near each other tend to be aligned in regions called Weiss domains. The domains are usually randomly oriented, but can be aligned during poling (not the same as magnetic poling), a process by which a strong electric field is applied across the material, usually at elevated temperatures. When a mechanical stress is applied, this symmetry is disturbed, and the charge asymmetry generates a voltage across the material. For example, a 1 cm cube of quartz with 500 lbf (2 kN) of correctly applied force upon it, can produce a voltage of 12,500 V.
Piezoelectric materials also show the opposite effect, called converse piezoelectric effect, where the application of an electrical field creates mechanical deformation in the crystal. Where S is strain, s is compliance and T is stress. where d represents the piezoelectric constants, and the superscript E indicates a zero, or constant, electric field; the superscript T indicates a zero, or constant, stress field; and the subscript t stands for transposition of a matrix. Although the above equations are the most used form in literature, some comments about the notation are necessary. Generally D and E are vectors, that is, Cartesian tensor of rank-1; and permittivity is Cartesian tensor of rank-2. Strain and stress are, in principle, also rank-2 tensors. But conventionally, because strain and stress are all symmetric tensors, the substript of strain and stress can be re-labeled in the following fashion: ; ; ; ; ; . (Different convention may be used by different authors in literature. Say, some use ; ; instead.) That is why S and T appear to have the "vector form" of 6 components. Consequently, s appears to be a 6 by 6 matrix instead of rank-4 tensor. Such a re-labeled nonation is often called Voigt notation. ↑ Douglas A. Skoog, Stanley R. Crouch, and F. James Holler, Principles of Instrumental Analysis (Cengage Learning, 2006, ISBN 978-0495012016). 'Piezo Terminology' —Piezo Systems, Inc..
'Piezoceramic micromotors' —PiezoMotor - the future of micromotors. 'History of Piezoelectricity' —Piezo Systems, Inc.
Japan: Producing Electricity from Train Station Ticket Gates—Piezo elements used in train station ticket gates. The Center for Piezoelectrics by Design—A consortium for research into the theoretical prediction and experimental realization of new members of a unique class of materials, piezoelectrics. "Piezoelectric Constitutive Equation" from Engineering Fundamentals. 'Fomos-Materials'—New piezoelectric crystals - langasite, langatate. Piezoelectricity - APC International, Ltd.